This is the poster I gave to the bodyguard backstage many years ago. 1. My words would transform Michael Hutchence into my husband. 2. Angels, unicorns and rainbows would secure our love with lightening speed. 3. I was really the ONLY GIRL IN THE WORLD WHO LOVED HIM THE MOST. Okay, I was a bit obsessed back then (I still wear my Kick tour pin on my jacket – thankyouverymuch) and just recently bought Kick on vinyl (that’s a record for all you millennium babies out there). 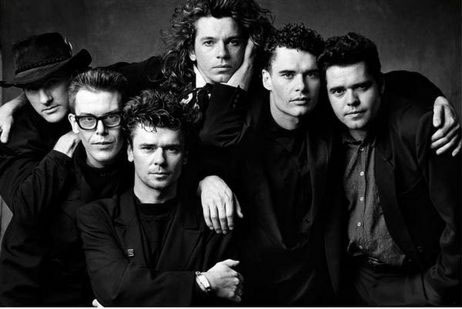 I still love INXS although I do think their work sans Hutchence makes about as much sense as replacing Mick Jagger in the Rolling Stones. To me, there’s only one INXS the rest is a really bad reality TV show. This entry was posted in Uncategorized and tagged INXS, Kick, Michael Hutchence, Mick Jagger, Mystify, Rock Star Reality TV show, Rolling Stones. Bookmark the permalink.